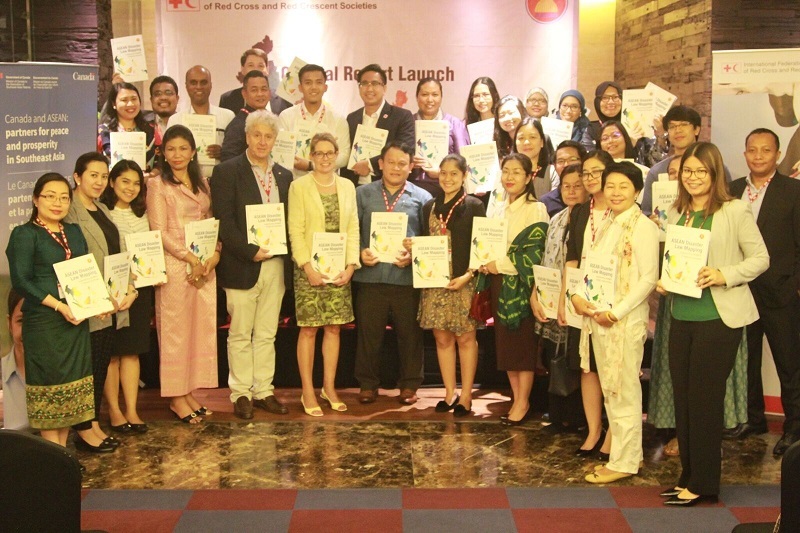 The ASEAN Committee on Disaster Management (ACDM), and the International Federation of Red Cross and Red Crescent Societies (IFRC) officially launched a report entitled “ASEAN Disaster Law Mapping – Implementing AADMER: A Regional Stocktake” on 2 May 2018 in Jakarta, Indonesia. The report contains the first ever mapping of legal provisions supporting national and regional preparedness and response mechanisms in the domestic laws of 10 ASEAN member states. The legal mapping was guided by the minimum standards set in the ASEAN Agreement on Disaster Management and Emergency Response (AADMER). It is accompanied by an online platform hosted on the Red Cross and Red Crescent Resilience Library. Mr. Vilayphong Sisomvang, Deputy Director General of the Lao PDR Ministry of Labor, speaking on behalf of the ACDM Prevention and Mitigation Working Group which his Ministry co-chairs, was pleased to see the strong collaboration between ASEAN member states, the ASEAN Secretariat and the IFRC in this initiative and encouraged participating agencies to use the mapping as a basis for cross-regional learning to strengthen preparedness and response for future disasters in the region. He also expressed the importance of this legal mapping to the ongoing legal review of Lao PDR’s disaster management law. He together with Giorgio Ferrario, IFRC Head to Indonesia and Timor Leste, thanked the Government of Canada and Canadian Red Cross, who supported this initiative under it Regional Resilience Initiative. The Government of Canada representative, Ms. Sharon Armstrong, Director for Development of the Embassy of Canada to Indonesia and ASEAN, emphasized the importance of strong disaster laws in resilience building, as well as the importance of gender equality in development. At the close of the launch, Mr. Ferrario reiterated IFRC’s commitment to building a more resilient ASEAN, and underscored the important foundation that inclusive laws and policies play in regard to this community resilience building. This institutional resilience component will form as an important part of the ASEAN Coalition for Resilience which aims at making 100 million people more resilient in ASEAN countries by 2025, as a direct contribution to the IFRC global initiative of the One Billion Coalition for Resilience.